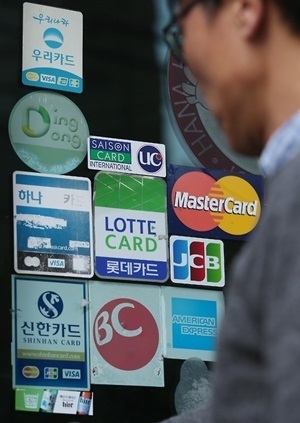 Hyundai Motor’s card transaction fee negotiations with Shinhan Card, Samsung Card and Lotte Card are nearing a conclusion, as the three card providers have agreed to accept a fee increase rate proposed by the carmaker, the involved companies said Wednesday. The three South Korean credit and debit card companies on Tuesday notified Hyundai that they each would accept the auto giant’s proposed rate hike. Hyundai is now said to be reviewing the terms of the respective deals. If Hyundai accepts the terms, it would effectively end a weekslong conflict over transaction fees between the nation’s largest carmaker and local credit card providers, which has been facing flak for inconveniencing consumers in the process. Last week, Hyundai proposed to partnered card companies to raise the fee from around 1.8 percent to around 1.89 percent. KB Kookmin Card, Hyundai Card, Hana Card and NH Nonghyup Card had already reached an agreement with Hyundai on the fee increase rate. BC Card concluded its negotiations Monday. However, Shinhan Card, Samsung Card and Lotte Card had sought a greater increase, and thus did not reach a deal with Hyundai before the negotiations deadline. As a result, Hyundai shot back by terminating its partnerships with the three firms on Monday. The fee hike dispute came as local credit card providers decided to charge higher transaction fees to its big-money clients -- those with annual revenues exceeding 50 billion won ($44 million) -- after profit-cutting changes to local card transaction fee regulations took effect in November.